Final Fantasy XIV: A Realm Reborn is seeking to right the wrongs of the past and recreate a failed MMORPG from the ground up. Square Enix has gone all out in revamping the game into an entirely new experience, hoping to free it from the horrible reputation of its first incarnation. The effort has clearly paid off. The new character models are a far cry better than the originals, brimming with personality and detail in their faces. Environments are also more exciting to run through, giving eye pleasing sights to behold and something to actually look at during long strolls between cities. Not only will the arrival mark the rebirth of Final Fantasy XIV on PCs, but PlayStation 3 owners will finally get a chance to join in the fun. Final Fantasy XIV was so bad that Square Enix scrapped all plans for a console release until it got the mess worked out. The trailer has footage from both versions. Those still on the fence of trusting Square Enix again after the last fiasco need not worry as a closed beta will start in June. Entry will be free, so consider it an extended demo. 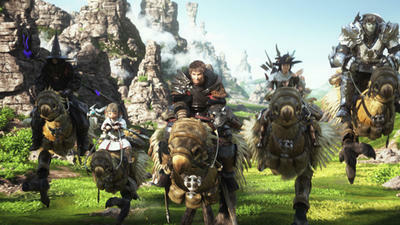 Square Enix had high hopes in following up the MMO success Final Fantasy XI created for them as the most profitable game in the series. With the right tweaks and adjustments, then could very well be onto replicating the game. I just hope gamers are willing to forgive and forget. MMORPGs seem to be on the way out of style, and another Final Fantasy XIV catastrophe could bury Square Enix. It needs this game to be a success.